Line blasters, either with countdown or not, and the rockets are your best ally in order to destroy the solid grey blocks (boxes) under the pets, or the cages that they are captured. At the bottom of the level a bomb makes the rescuing of pets much easier. 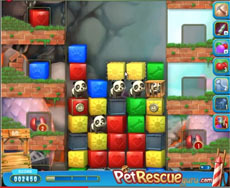 Pet rescue level 254 is not a difficult one. But if you face any problem the following video will show you the right strategy to complete it.